In Mel's family it has always been her eldest sister Debbie that is known for her serious addiction to handbags, shoes and watches. But lately Mel is becoming aware of her own weakness for cute handbags! To keep this layout funky and bright to match the little crocheted bag, she used the BasicGrey Gypsy range including the gorgeous ribbons and added a dash of Heidi Swapp plastic alphabet letters for the title. For this layout Rach wanted to capture that becoming more girly because of having a girl is a big part of her life, and she loves this photo that Mark took in their backyard in Canberra. 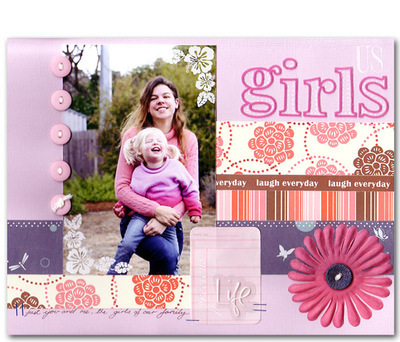 Rach has used lots of product and had lots of fun putting this layout together. She wanted to use the Silhouette Word from the FK onsert which said 'My Life' but didn't want the 'my' part so she carefully cut it off and kept it for use another time. This time to attach the word Rach stapled it to the layout! When you get old the early years tend to blur a little around the edges. This is what happened to Caz in the last 2 years of primary school. So this is a page about when she was 10 (or so)... maybe 11, who can remember that far back?! 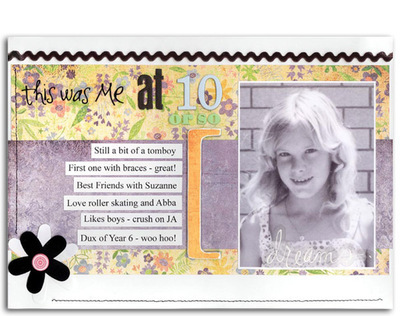 Roller skates, Boys, Sleepovers, Boys, Abba, Boys… she thinks that was pretty much how it went. Though she admits she did actually like school back then and not just for the social side. Caz chose some rather feminine, girly BasicGrey papers (even though she was still a bit of a tomboy) BasicGrey velvet ric-rac and a covered BasicGrey chipboard bracket. Another home-made Silhouette using a transparency and Heidi alphabet. Heidi Swapp chipboard and plastic alphas, Queen & Co flowers and brads and machine sewing keep this months theme ongoing. Tamar's journalling reads "the best laid plans - a photo shoot with Rachel Richter carefully timed in a crazy schedule clothes props venue time all organised but we didn't check the weather - a huge thunderstorm was the end to all our planning - trying again next week." Tamar has used the onsert from FK for the word hope and added dashed from the Lil Davis letters - she likes the titles on this page - Photo Shoot - Hopes Dashed and Laugh Loudly. - the mini titles altogether give good overview of the experience really. The past year has been a huge one for Marni and her husband so she went in search of a photo taken a year ago and one taken more recently to document some of the changes that they have gone through. Marni does not like to journal but when she does she likes to hide it so the two photos on this layout actually lift up to reveal the journalling about each year. 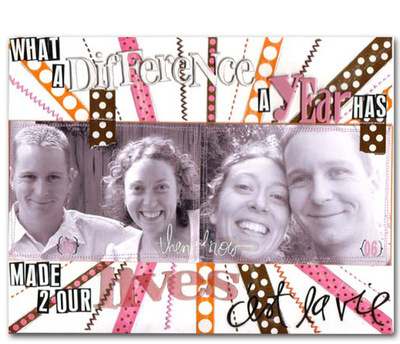 She created the hinges that allow her photos to lift up using Heidi Swapp tape. 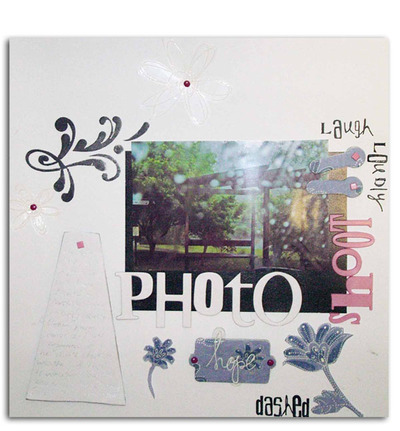 Her focal point for the layout is the photos so to draw your attention to them she has placed some Heidi Swapp tape and hand stitching at angles. Nic has used a group of photos to form a collage on her photo, displaying all things in her life right now that mean the most to her. Among these are family, friends, her daughter, boyfriend, hobbies, as well as things like laughter, smiles and memories. 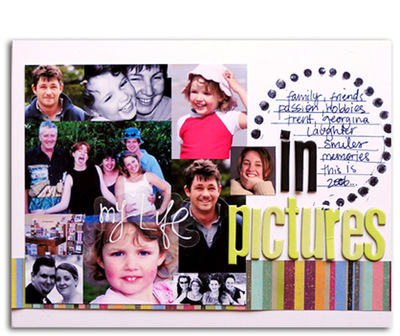 Nic has used the Heidi onsert from the For Keeps Magazine and placed it over her collage of photos, it is the start of her title. Heidi Swapp Chipboards create the rest of the title finishing it off. Nic has then stamped the dots to form a circle, and added journaling in the middle. 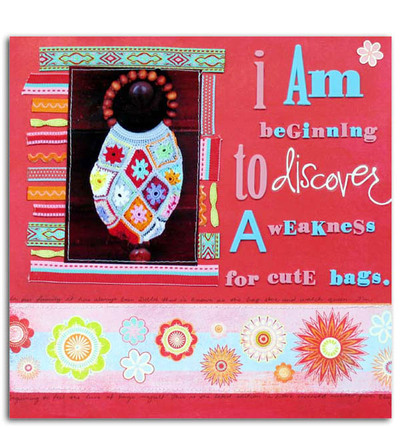 She has used Carolees Creations patterned paper on the page to create a little more colour.